This entry was posted in Art, Blog Hops, Christmas Cards and tagged Christmas cards, Christmas Eve by pilch92. Bookmark the permalink. That is a LOT of cards! Merry Christmas to all of you! A beautiful collection of holiday cards! The Festivus party was wonderful yesterday and we thank you for hosting it Phoebe……a lot more people know about Festivus now that’s for sure. We hope you all have a delightful Christmas Eve and that if any of you are planning to stay up tonight to see Santa arrive, you’d better hide good…..he sees ALL!!!!! You have so many beautiful cards your friends have sent! Sorry i don’t know how to do that, please know that i do wish you and all your family a Merry Christmas! So many wonderful Christmas cards. You have a very Merry Christmas. Merry Christmas, dear friend! HUGS. So many pretty cards! Merry Christmas Eve from all of us! These are all wonderful cards! We hope everyone has a wonderful Christmas! What a nice idea to use all hte cards as a Christmas post. You are so very very creative. he he – next years everyone will be doing this., We hope you and your family have a most wonderful Christmas and Happy, healthy, 2017. Every single one of these cards is so purrfect and festive! We are wishing all of you a very merry Christmas Eve! Those card were all so beautiful especially when you put them together. Wow, these are all so beautiful! Merry Christmas to all of you! Everyone’s cards are beautiful. Thanks for sharing them! You have lots of beautiful cards. I see my email card to you. I hope you also have received my snail mail card. I can’t remember if I have already thanked you or not for my card which arrived a few days ago. So many cards! I hope the wind doesn’t blow them off the cyber-mantlepiece! A magnificent collection of cards!! Happy holidays to you all! What wonderful cards! Merry Christmas to you all. So many beautiful greetings. Merry Christmas Eve, friends! We have such creative furrends! Merry Christmas! We sure do. Merry Christmas! Oh my gosh. So many cute cards! Hope yall have a wonderful Christmas! Wow, you did a superb job with that collection of cards…they are awesome! 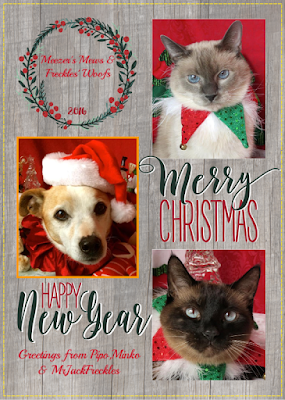 Wishing all of you kitties a Meowy Catmas and your Mom & Dad & Grammie a very Merry Christmas…hope you have joyous holidays and that Santa surprises you! Beautiful display of cards, showing you are much beloved,Ellen!. But if you get any cards, you may have to move out of the house to make room for them! Mee-yow there are so many cardss Purrincess Phoebe!!!! 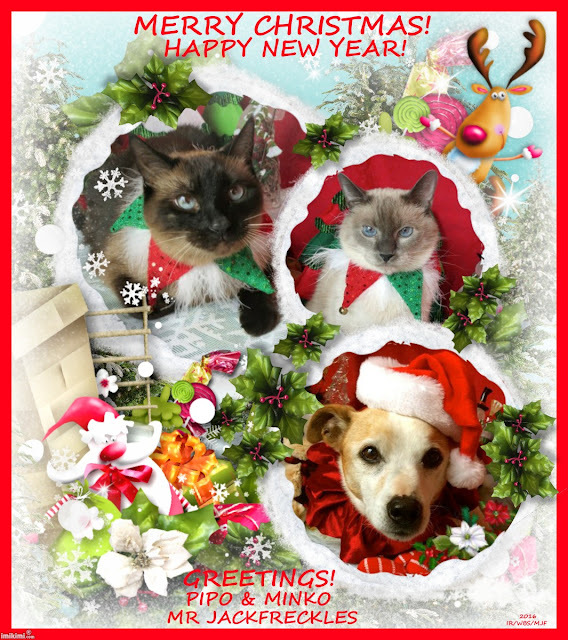 Mee hopess all of youss’ had a furabuluss Katmass…..
Mee sent a reply back to yur email Purrincess Phoebe…..fingss been ruff here.